On Karakoram Highway enroute to Hunza. 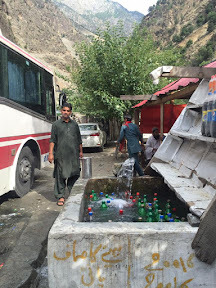 Multiple food stalls have been built by locals around this water stream called Summar Nallah. The cool breeze from this stream gives a very sooting effect and its water is used as natural refrigerator. June 4, 2016, 11:45 a.m.